Nothing says the holidays like peppermint and chocolate. On December 1st, I’m all about the peppermint chocolate combo. We break out the candy canes, and stick them in hot chocolate, crush them and dust them over everything – chocolate pancakes, waffles, and any ice cream or cookie that we can find! So these Dark Chocolate Peppermint Star Cookies were a hit. 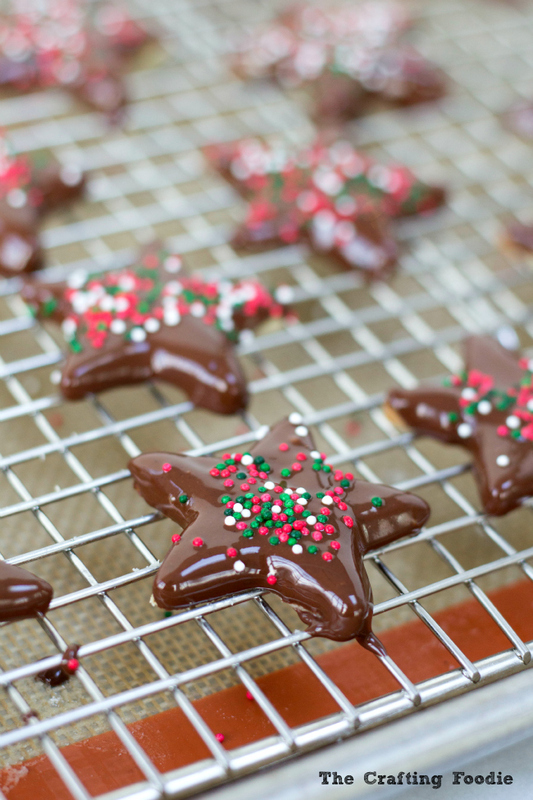 These Dark Chocolate Peppermint Star Cookies are my entry in The Christmas Cookie Recipe Swap. When I signed up for the swap, I was hoping for something with chocolate, and luckily I got paired with Melissa from Persnikety Plates. Her blog is pretty awesome. It has a great mix of desserts, snacks, and meals, and the best part, is that they’re all family friendly. 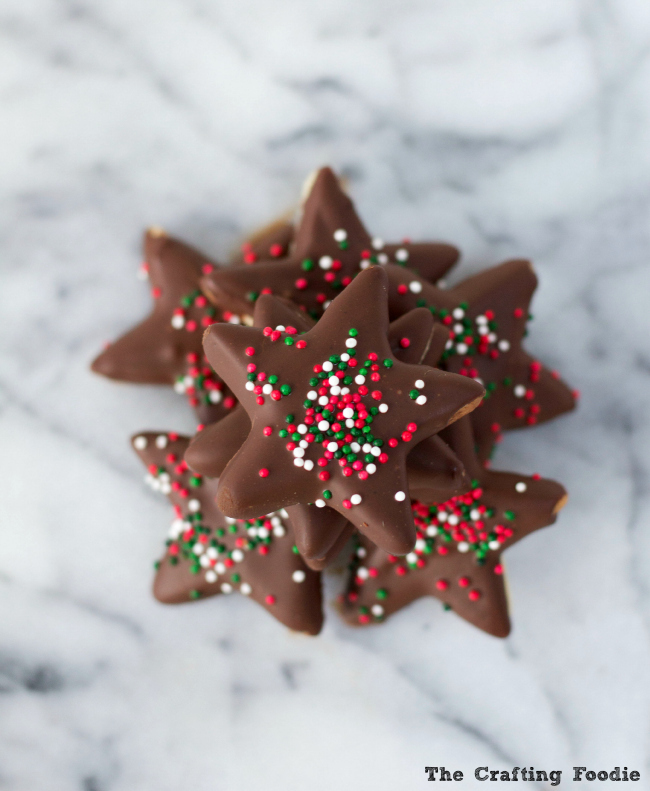 And after making her recipe for Dark Chocolate Stars, I can tell you – Melissa’s recipes are easy and delicious. 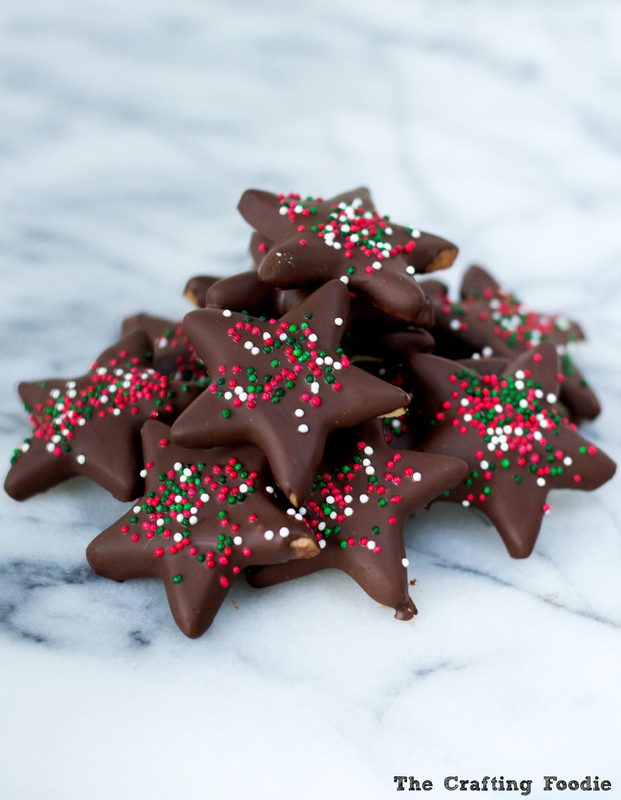 If you’ve ever tried Trader Joe’s Mini Dark Chocolate Mint Stars, this is a homemade version of those delicious treats. But, I have to admit, Melissa’s version is even better. The cookies literally melt in your mouth, and the dark chocolate on top makes them extra rich without being too heavy. The base of these Dark Chocolate Peppermint Star Cookies is a peppermint short bread that literally takes 5 minutes to whip up. Melissa’s original recipe is a plain shortbread, but I couldn’t help but add some peppermint extract to the cookie. Then you dip the entire cookie into melted dark chocolate. They’re such simple cookies, but they’re so decadent. I think they’re going to take a permanent spot in my holiday baking rotation! In the bowl of a mixer fitted with a paddle attachment, cream the butter until smooth. Add the powdered sugar. Mix until light and fluffy. Add the extract. Mix until combined. Add the flour and salt. Mix until just combined. Form the dough into a circle, then flatten into a disk. Wrap in plastic wrap. Refrigerate for at least 30 min. While the dough chills, preheat the oven to 350 degrees F.
Once the dough is chilled, lightly dust the work surface with flour. Roll out the dough to about ¼ inch thickness. Place stars on a sheet pan lined with parchment. Bake for 8 to 10 min. Remove from the oven, and place cookies on a drying rack. Allow to cool completely. Melt the chocolate and shortening. Once melted, add the extract. Dip the cooled cookies in the chocolate. Chill in the refrigerator until chocolate is firm. These cookies are so cute! Bring on the holiday baking! A Christmas cookie swap sounds SO fun! These cookies sound like a winning recipe for sure. Nothing like peppermint and chocolate around the holidays! I commented on these last week but I don’t think it went through – love the addition of peppermint & I’m glad you liked them! Thank you again, for the awesome recipe, too! =) Happy holidays!